Those pesky Martians have been busy. They have been attacking the earth since 1962! The invasion began through the original set of trading cards published by the Topps Company, and has continued through toys, comic books, novels, apparel and even a big-budget Hollywood movie (the 1996 Tim Burton film). 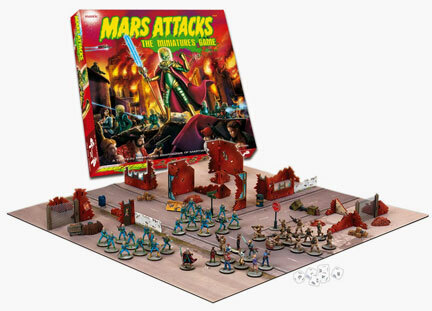 And now they’ve come for your tabletop with the release of Mars Attacks: The Miniatures Game from UK-based Mantic Games. 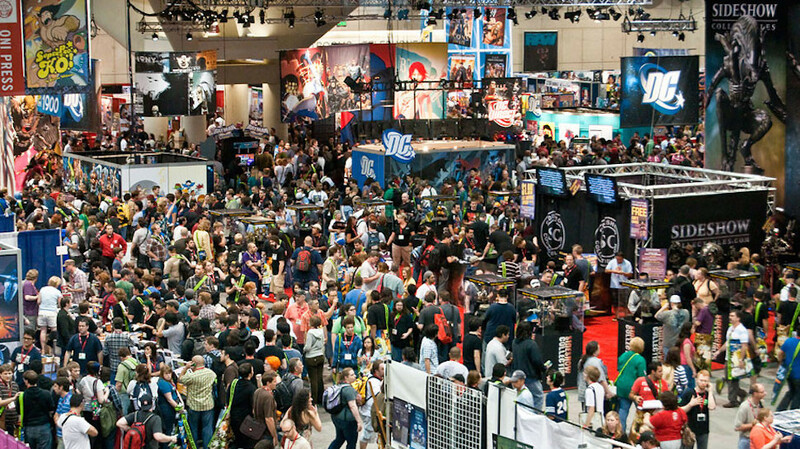 The game was funded through a very successful Kickstarter, raising over $500,000 in late 2013. The final product has just begun to appear on store shelves. When Topps started to aggressively promote the Mars Attacks property again a few years ago for it’s 50th Anniversary (! ), I recall them asking on Facebook what sort of products fans wanted to see. I said I wanted some sort of tabletop game. In my mind I was thinking something limited like a Heroclix Fast Forces set. But, Topps had grander plans and approached the good folks at Mantic Games (Kings of War, Dreadball, Deadzone) about making a game based upon Mars Attacks. 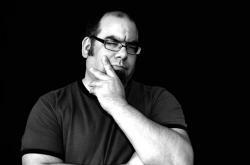 Mantic turned to game designer Jake Thornton, with whom they’d already developed several other successful games and began work bringing the crazy, over-the-top world of Mars Attacks to the tabletop. Topps was kind enough to send me a copy of the game so I could take a crack at it. 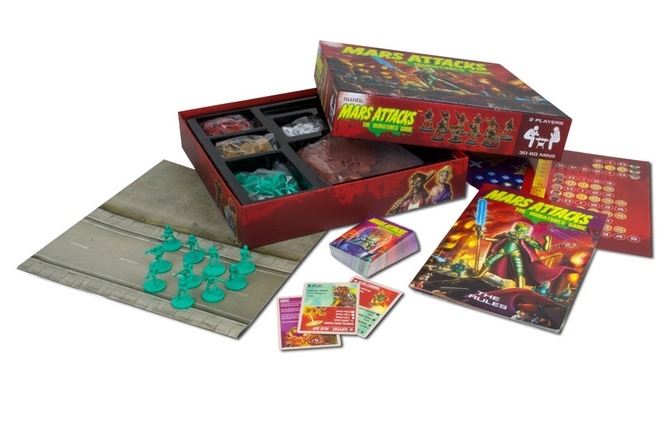 I wasn’t able to pledge for the game during the Kickstarter campaign (although, I did pledge for the Martian Dreadball team)…but, as a longtime fan of Mars Attacks I’ve been following the development of the game with great interest. Injury Counters, Heroics and more! The included fold-out battle mat is your play surface, representing the streets of the once peaceful town of Greenville, USA where the invasion is taking place. The mat is paper. It does the job, but I wanted something more. Fortunately, Mantic offers a deluxe gaming mat made of durable mousepad material. So, I made a quick trip to my local gaming store (Guardian Games in Portland, OR) and picked up the deluxe mat. There’s two separate mats available, a T-junction and a straight road option. I went with the T-junction as it replicated the mat included in the box. Tom played the Martians, while I played a squad of defending human soldiers. The 40 page rulebook offers 10 different scenarios to play though with differing victory conditions. I love scenarios. Sure, I dig a good shoot out as much as the next guy…but, scenarious offer considerably more variety in gameplay. One thing I really appreciated about the game is that the plastic miniatures come pre-assembled (except the included Martian helmets), and colored ready for play. The Martians are green, the soliders are tan and the hero characters (human and martian alike) are red. If you like to paint your minis then these are ready for you. If you don’t, that’s fine. You can play with them right away! I enjoy building miniatures, but I like playing games more. It goes a long way to making the game more accessable to a wider audience. 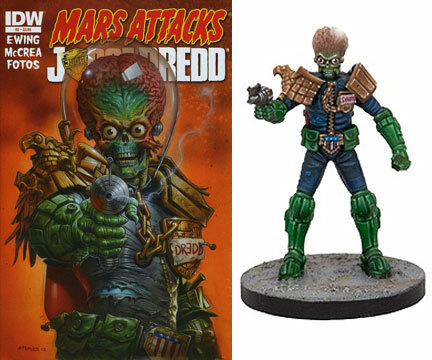 The miniatures are very detailed, and overall great looking pieces that bring the Mars Attacks world to life. Another really cool aspect is the modular scenery. The game comes with a bunch of snap-together modular terrain. Most of it looks like ruined brick buildings, representing the aftermath of the Martians initial attack on the town of Greenville, USA. The terrain pieces, molded in red plastic, can be assembled in a wide variety of configurations utilizing some clever snap on connector pieces. Additionally, there are piles of rubble, fences, a street sign, a road sign, mailboxes and trash cans. Cover (having something to hide behind) is pretty vital to the gameplay. The included scenery provides ample opportunities for cover for both the invading Martians and the defending humans. It’s great stuff. Mantic also sells the scenery separately, so you can expand your terrain options if you’d like. Gameplay is pretty straightforward. The rules aren’t overly complex, yet allow for lots of strategy. If you’ve never played a miniatures game before, it would be easy to get into Mars Attacks. And, it’s quick. You can get a game in in just around an hour. Combat is dice based, using the stats included in the rulebook. The play mat has a grid on it for basing your movement and combat on. There is also a deck of cards that grant special actions, events or abilities for both Martians and humans alike. The cards, along with the scenarios, help to bring a lot of replayability to the game. It’s more than just straight up shoot-’em-ups. One event card that came up in our game brought a giant alien bug onto the battlefield in a random location. It would then hop about randomly (there’s corresponding rules for scattering) at the end of each round. There are basic grunt troops for each faction. Humans have soldiers and the Martians have generic troops. Spicing things up are the Hero characters. The Martians only get one hero in the box, the evil General Tor. The humans have nine. The human heroes, for the most part, are everyday people stepping up to fight of the fiendish Martians. There is one particularily interesting hero, Edwyn. Edwyn is a knight from 1504AD who fought the Martians in his time and was defeated and placed in stasis, only to be awoken in our time to continue his fight. The various hero characters all possess special abilities that aid in the battle against the forces of Mars. I’ve been a gamer for a long time, and tabletop miniatures games are my favorite type to play. I’m really excited to add Mars Attacks to my collection, and plan on playing it alot. A lot of minis games today are very serious. Mars Attacks, befitting it’s inspiration, doesn’t take itself too seriously. It’s color, wacky and weird. But, most of all it is fun! And, really, isn’t that what we want in our games, to have fun? As I mentioned at the beginning, this game was funded via Kickstarter in 2013, and was very successful. Because of that success there’s lots more coming for the game. A few items are out not, besides the core game. There’s a pack of civilians that replace some of the cardboard tokens that come with the game, including a flaming herd of cows! There’s additional packs of Martian and human soldiers to bolster your forces, and additional scenery. There plenty more to come including characters inspired by the IDW Mars Attacks comic books and, my personal favorite: Martian Dredd. Yup. It’s a Martian dressed up as Judge Dredd. He’ll come in a set with a 2 dead US Troopers, and a dead Martian. Too cool. …and, it’s just the tip of the iceberg. So, if you’re a fan of Mars Attacks, or of miniatures games in general, I highly recommend Mars Attacks: The Miniatures Game. Hi Jeff! I’m nearly done painting my Mars Attacks set and was looking for other folks who dig this game. You happen to know of community here in Portland?